Castle Comfort Stairlifts offers top brand stairlifts, keen prices and fast installs for all those seeking stairlifts in Coatbridge, Lanarkshire . And all work comes with our no-quibble guarantees and famous customer service satisfaction. Coatbridge is just 10 miles east of Glasgow and right next door to Airdrie. The two towns make up the Monklands area of Greater Glasgow. The area was first settled in the Stone Age, now Coatbridge is almost entirely populated by those of Irish descent. The origin of the name Coatbridge has too many probabilities! It is thought it might have taken its name from the old Scottish for cottage (cot) and bridge (brig). Equally some think that it might refer to Middle English or old Welsh for cote or coed respectively, the first meaning cottage again and the second wood. The third possibility is that it is named after the Colt family who owned much of the local land circa C13. The Colts were sometimes referred to as Coats and places around their estate became known as Coatbridge, Coatdyke, Coathill and Coatbank. We’ll leave you to decide! One thing Castle Comfort Stair Lifts do know is that there are almost 8,000 retired folks in Coatbridge though none of them date back to the C13! Something else we are sure of is that around 200 of this retired population already own stairlifts. How do we know? 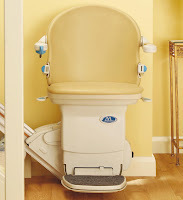 It’s simple, we keep count of every stairlift sold. Take a look on our website where we have a minute by minute changing counter which records how many stairlifts have been installed. So if you’re concerned about your ailing mobility and think it might be time to consider this mode of ‘transport’ in your own home, we’re your guys. Give us a call at our local office on 0141 278 3929 so that we can advise on the type of stairlift you need – straight, curved or perch – and let us assess you so that we get it right. We can supply from the wide range manufactured in the UK including our own-name brand. What’s more once it’s all signed and sealed we can have it installed and working in your home within a few hours maximum. We also have a great 24/7 after sales service so that you never find yourself stranded at the top or the bottom. There is much evidence of occupation of the actual settlement at Coatbridge especially from Bronze Age times. There is also an Iron-Age wood and thatch dwelling (crannog) which can still be seen at the loch in Drumpellier Park when the water is at a particular level. Roman coins and the remains of a Roman road have also been found in the area. The name for the bigger area, Monklands gained its name from Cistercian monks who founded New Batlle Abbey here with permission from King Malcolm IV. The monks mined coal and farmed the land until the Reformation when all was taken from them. At this time the parish of Monklands was divided into New Monkland which is modern day Airdrie and Old Monkland, Coatbridge. As we’ve mentioned Coatbridge’s population has an Irish heritage. This is mainly due to a big influx of Irish workers who came over when iron ore was mined locally and blast furnaces were invented. The production of pig iron was big in Coatbridge and it was much in demand for building railways here and in the Commonwealth, ship building, bridge buildings and construction generally. The canal that ran through the town was used to transport it. The population grew by 600% in the early 19th century turning the once rural Presbyterian area into a Roman Catholic town. Most of the Irish immigrants came from County Donegal in Ulster. The legacy through the 20th century was a host of Irish dance and language schools not to mention a Gaelic football team. Anyone who knows the Irish, knows that they are fiercely patriotic so the other legacy was the celebration of St Patrick’s Day. This year’s celebrations included a street party and an extensive programme of cultural events which included music, dancing and theatre productions. There were also lectures and exhibitions and of course sporting events. Big draws were a concert by JJ Gilmour and ‘An Evening with Father Ted’. Add an Irish Quiz, Gaelic football and a family Ceili and you can see just how seriously they celebrate in Coatbridge. Are you an old rocker or just off your rocker with frustration? There’s no need to be, Castle Comfort Stair Lifts are here with all the knowledge and advice you need. 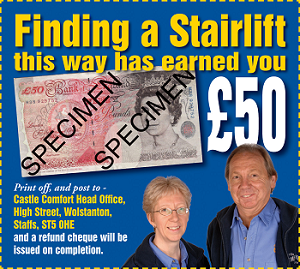 We can find the right stairlift for you. If the cost is a concern, why not look into the possibility of a grant or maybe a 0% finance deal? And don’t forget we have reconditioned stairlifts too. What ever your concerns or questions, or if you just want to get a deal sorted, please call our local office on 0141 278 3929 . We’ll get onto it in no time.